View More In Pacifiers & Accessories. 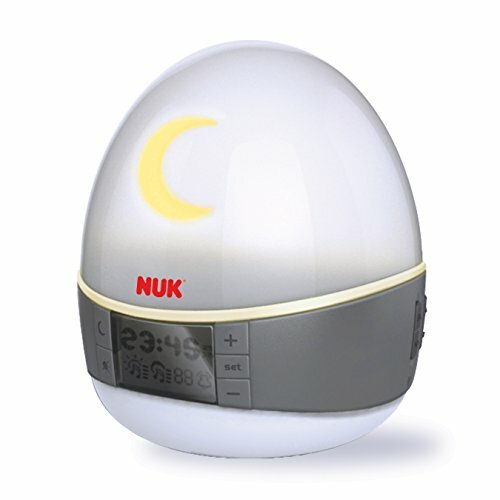 Get better bedtimes and better mornings with the NUK Natural Sleep System, featuring programmable lights & sounds! Light & sound work together to help babies fall asleep and wake up naturally. Light & sound fade during sleep cycle for 15, 30 or 45 minutes and offers 4 soothing sleep sounds: car ride, womb, rain & white noise. Sleep cycle ends with glowing moon that stays on as nightlight. (Amber nightlight is better for sleep than blue or white nightlights, which suppress production of the sleep hormone melatonin.) Light & sound rise together during wake cycle for 15, 30 or 45 minutes with 4 classical music songs to help children wake-up with a brain primed to learn! Wake cycle ends with moon changing into glowing sun. For more information, please see the product manual and/or product instructions. The NUK family of brands design and develop superior products that enhance your child's overall development. By combining years of expertise and trust, we are committed to nurturing your children's healthy transitions from birth to toddler. We have worked for over 50 years to design the highest quality products that are innovative and scientifically-proven to support safe and healthy development. Backed by a dedicated team of experts, our products are designed to combine science with style while maintaining the highest quality. Our products don't just meet international safety standards, they exceed them. And we listen to the real world experts - moms just like you - to meet and exceed your needs. If you have any questions about this product by NUK, contact us by completing and submitting the form below. If you are looking for a specif part number, please include it with your message.